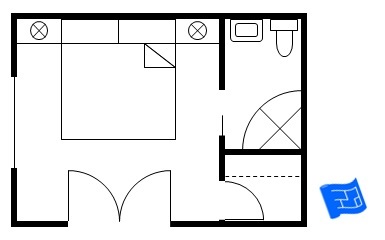 Layouts of master bedroom floor plans are very varied. 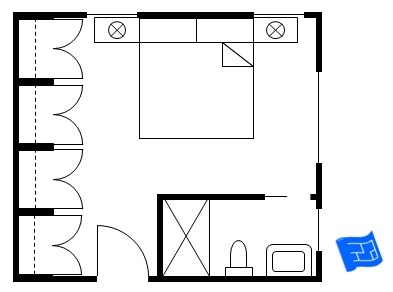 They range from a simple bedroom with the bed and wardrobes both contained in one room (see the bedroom size page for layouts like this) to more elaborate master suites with bedroom, walk in closet or dressing room, master bathroom and maybe some extra space for seating (or maybe an office). 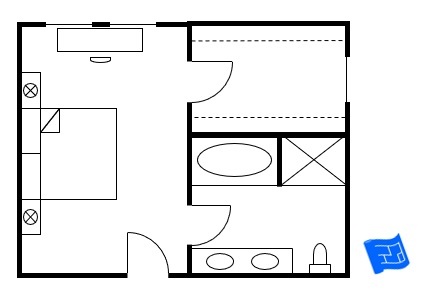 On this page I've put together lots of master suite layouts and included a section on adding an en-suite bathroom to a bedroom space. So let’s take the three main spaces – bedroom, walk-in closet and master bathroom. These can be arranged in the different ways which we’ll discuss as we go along... You’ll get a feel for which arrangement you might prefer. One of the main things to have in mind when thinking about space sequencing for your master bedroom floor plan is how important it is for one person to be able to use the bathroom and get dressed (or undressed) without disturbing the other person. 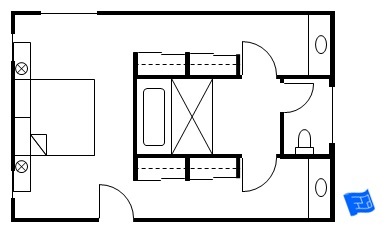 This type of master suite layout is very efficient because there's no space wasted on circulation between the different spaces. The main disadvantage of this way of sequencing the master suite spaces is that while one person can go to the bathroom or into the closet and close the door to avoid disturbing the person still in bed (lucky them), they have to come back out into the bedroom to go to any of the other spaces. 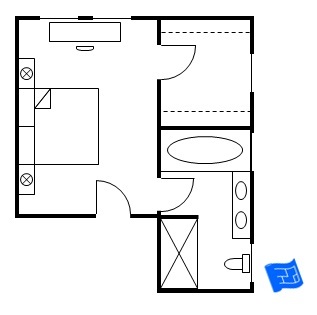 Master bedroom floor plans like this one below is a good layout for this type. There's no wasted space and the circulation is all handled well around the bed. There are no doors too near the head of the bed, although I might be tempted to change those double sliding doors into a single door further down at the end of the bed. The seating nook would be a really cozy place to be. The dressing table is at the foot of the bed. There is plenty of space for it there but I'm not a fan of mirrors around the bed (but you might not be bothered by this). I might put a slim sofa at the foot of the bed and move the dressing table into the nook at the side where the seats are instead. The circulation works nicely in this floor plan as well. 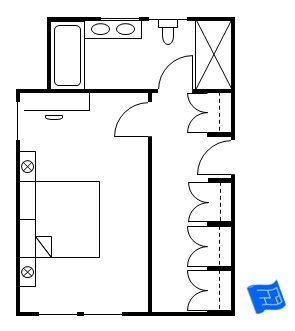 Notice how the door for the closet has been placed slightly off center to preserve a nice uninterrupted stretch of wall at the foot of the bed. The arrangement below is along the same lines with a larger closet and on a rectangular footprint. Entrance is straight into the bedroom then a door leads to the walk-in closet which leads in turn to the master bathroom. 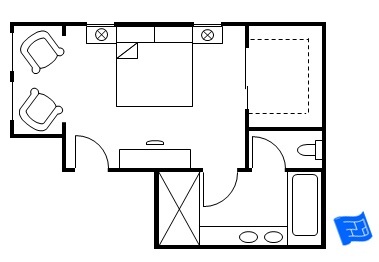 This master bedroom floor plan has the advantage of having the bathroom a nice distance from the bedroom so noise is minimized. On the minus side it's a long way to go to the bathroom! There's his and hers closets here - something worth thinking about if you've got the room. Here's another arrangement with his and hers closets that flank a central bathroom. Part of the wall to the shower and the door to the toilet could be translucent or etched glass to allow light through the bathroom. If a separate bath and shower are important to you here's a variation that might be suitable. Entrance is straight in the bedroom then a door leads to the master bathroom which leads in turn to the walk-in closet. If the closet is accessed from the bathroom watch out that the path doesn't go through a wet zone - if so you're asking for wet socks and bringing water into the closet and bedroom on your feet. 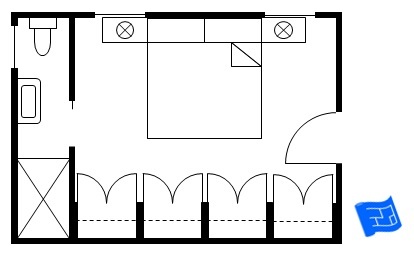 In this plan the path from the bedroom to the closet through the bathroom avoids the shower wet zone. The shower could be placed at the bottom of the bathroom keeping the wet zone out of the way but the closed off toilet room would have to be sacrificed for that. The dressing table is in the dressing room rather than the bedroom - which means you can get to work with the hair dryer without making too much noise. And then there's the useful door out of the closet which means that someone could wake up, close the door to the bathroom for their shower, go through to the closet to get dressed and then leave without disturbing their significant other. Here's another master bedroom floor plan with entry into both the bedroom and the closet, each with an entry into the bathroom. The bedside lockers are replaced with a shelf behind the bed. The wet zone in the bathroom is all on one side. There's a bench next to the bath. The walk in closet has loads of wardrobe space, a double chest of drawers with a bench on the end and a dressing table. What's not to like! Entrance is into a vestibule then one door leads to the bedroom and one door to the bathroom. The wardrobes are housed in the bedroom. The dressing table fits nicely into the vestibule here. I could be tempted to lengthen the bathroom a bit to make room for a double vanity. Entrance is into a vestibule then one door leads to the bedroom, one door leads to the walk-in closet, one door leads to the master bathroom. These arrangements allow one person to get up and go about their business without disturbing the person still asleep. 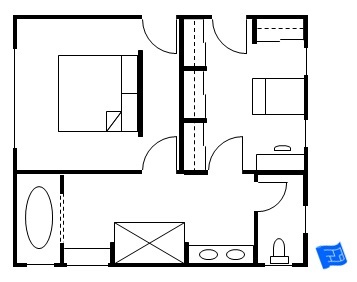 Here's a space efficient master bedroom floor plan with a standard sized bath and a good sized dressing room with room for a dressing table. The bedroom is exactly that - the bedroom. Here the vestibule doubles as the walk in closet. There's an argument for swapping the positions of the bath and shower to keep the wet zone out of the way at the end of the bathroom - it's the shower that gets day to day use. In this arrangement the bedroom doors come in at the head of the bed - which is something I try and avoid in a stand along bedroom because it compromises the feeling of being protected. In a suite the bedroom is in a sort of inner sanctum so feels private from the rest of the house. 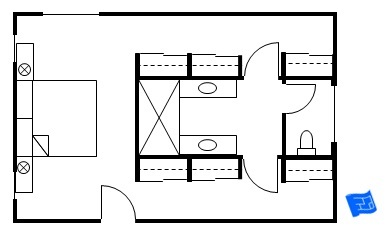 Here's another version of this master bedroom floor plan. 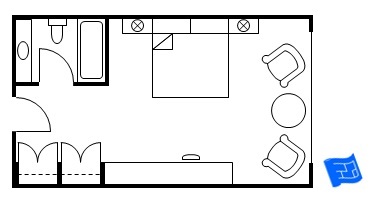 Here's a layout you might be familiar with - the standard blue chip hotel room repeated the world over. You could replace the bath with a shower - and the bathroom door opening straight onto the toilet isn't great but at least you won't be looking at it from the bed. It keeps the size of the bathroom to a minimum. So this next one might be the equivalent of a souped up hotel room layout. 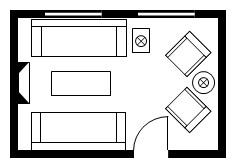 The dressing room could be left open plan or closed off with sliding doors as shown. Here's a great master bedroom floor plan with lots of dressing space, luxurious bathroom and comfortable sleeping space. This arrangement handles the circulation well and is quite an efficient use of space. I'd be tempted to add in an archway or a reduced ceiling level over the bed to give it a feeling like an alcove. Entrance is into a vestibule then one door leads to the master bath and one door leads to bedroom where there is a door to the walk-in closet. 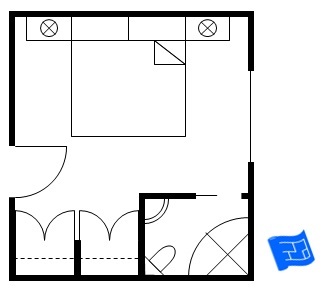 This is a more unusual master bedroom floor plan. Given this outline of space I'd be tempted to sequence the dressing room before the bathroom. You may be in the position of wanting to add an en suite bathroom to en existing space or maybe you're thinking of taking in a space next door to the master bedroom, such as a smaller bedroom in order to add a bathroom and closet to the space. If, so then this section is for you. I've done up a few layouts of adding bathrooms to the corner of an existing room, or by taking a strip at one end of the room. 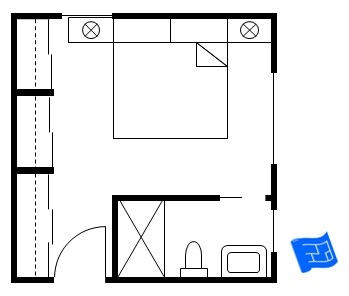 You can work out a rough idea of the sizes of these rooms by looking at bedroom size and small bathroom floor plans. So, first up... here, a corner of the room has been used for a really compact bathroom using fixtures that fit into the corners. There's also potential to square off the space and create a walk in closet. I think I prefer this arrangement. 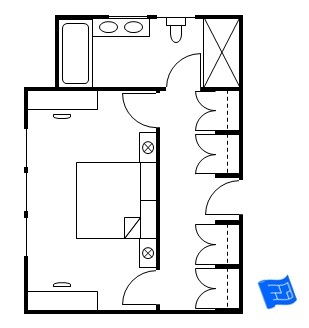 Notice how the doors to the closet and the bathroom are either side of the bed which means there's a stretch of wall at the base of the bed. The door swing into the bedroom clashes slightly with the closet door but I think this is preferable to having the door open straight onto the side of the bed. 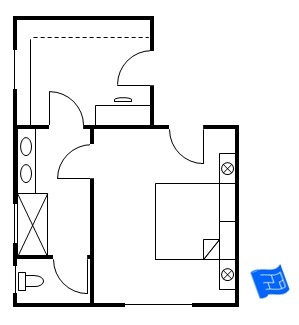 I talk more about door placement for bedrooms on the bedroom design page. You could opt for a smaller closet and a slightly larger bathroom if you like although there's not much wardrobe space in this design below. Usually I wouldn't recommend doors opening onto the front of the bed but in this case I think the symmetry of a double door will make the arrangement feel comfortable. 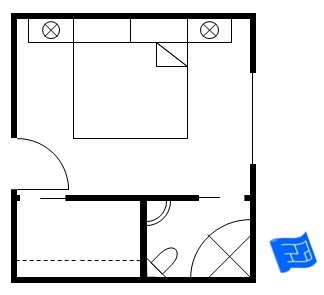 Here's another master bedroom floor plan using the corner of the room for the bathroom. No problems with wardrobe space here. The space requirement for this layout reduces slightly if sliding doors are used on the wardrobes as shown below. Now let's look at some design where a strip of space is taken to create the bathroom. Both of these designs could be made a little more compact if sliding doors were to be used on the wardrobes. 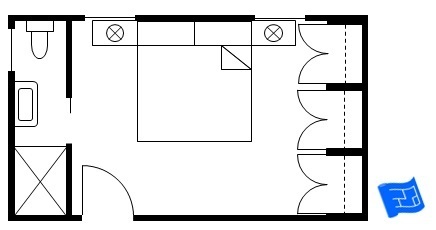 In this design the bathroom strip is perpendicular to the wall of wardrobes. Using sliding doors would mean that the shower should have to be smaller. 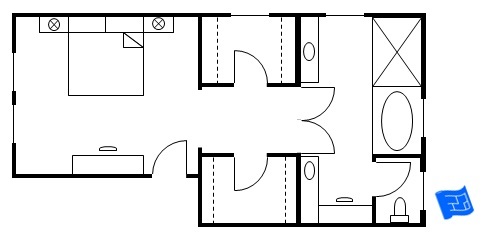 In this design the bathroom and wardrobes are on opposite walls. Changing the wardrobe doors would have no impact on the size of the bathroom. Picture a bedroom, walk in closet, master bath with toilet, vanity and shower and a bath in the bedroom (maybe prominent in the room or maybe behind sliding doors). This takes into account that showering tends to be a day to day practical activity whereas bathing tends to be for relaxation. 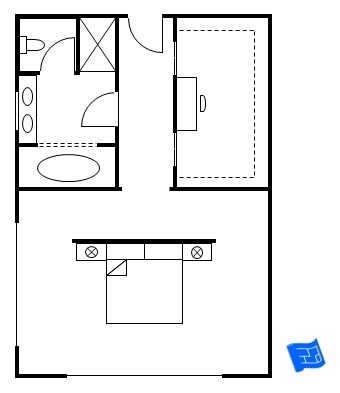 If you have any other ideas or have come across any interesting master bedroom floor plans please let me know. As well as the principles of good bedroom design there are two other points I’d like to put forward for master bedroom design. Watch out for those doors. As well as the entry to the bedroom master suites sometimes have a further two doors (walk-in closet and master bath). Make sure that the door placements and the furniture all work together. If possible all doors should be beyond the foot of the bed – leaving the bed in a zone relatively free of circulation. One activity that’s often overlooked in master bedroom design is where grooming activities such as applying and removing make-up, hair drying, giving yourself a manicure / pedicure etc will take place. A special area for this in the bedroom, walk-in closet (or dressing room) and/or bathroom can make these activities feel really special rather than leaning forward awkwardly over the bathroom vanity to apply make-up or sitting on the bed to blow dry your hair. You might need to consider more than one area depending on which activities require access to water and/or power. Whenever I'm looking at interior decor images I can't help thinking about the bones of the room - behind the decoration. Take a look at these images with my observations in the captions.